We all make a lot of jokes and snide comments about summer in the UK, but really, it is a special time. All the people, animals and berries come out of hibernation and put on an elaborate show of flesh, fitness and fruitfulness. It’s also a season of inspired weekend ideas. 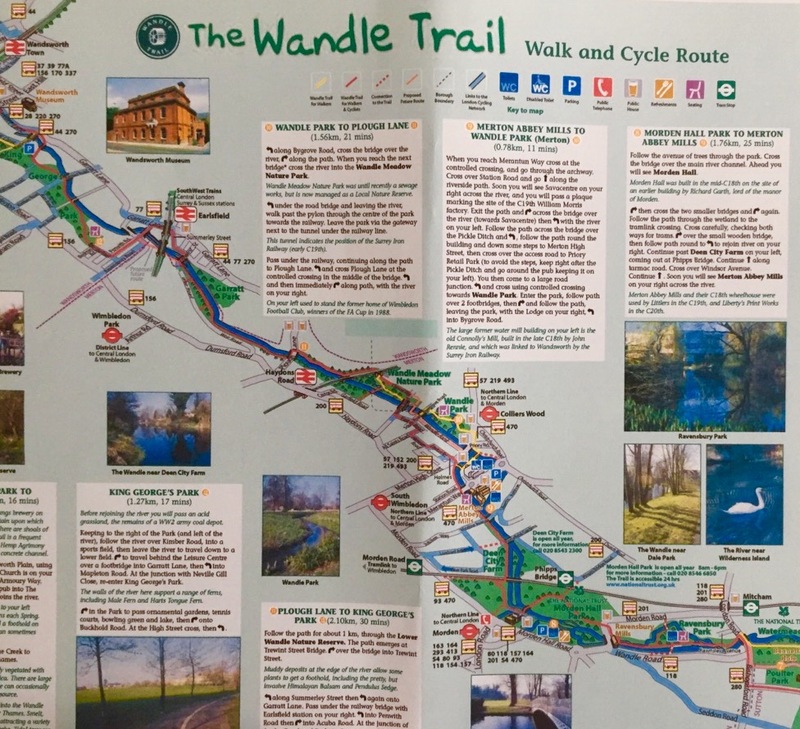 This weekend hubby and I cycled the Wandle Trail. We donned our white legs in shorts, pumped up bicycle tyres and oiled chains (in point of fact, hubby actually did the oily dirty work – MWAH!). We packed water, pears and dried peaches and set off. This part I always find challenging – carrying my bicycle up and down stairs in crowded train stations and finding a spot in the cramped cycle carriage, all the while repeating “sorry”, “sorry” and “sorry”. But this part does not last forever and we were soon on the trail, starting at the Wandle ponds in Croydon. Croydon – not my favourite part of the southern Greater London area – populated by factories, poorly managed high rise flats, super stores and over flowing rubbish bins that Merton Council forgot about or just couldn’t be bothered with. But the Wandle river, a small slightly overgrown, winding oasis was beautiful. 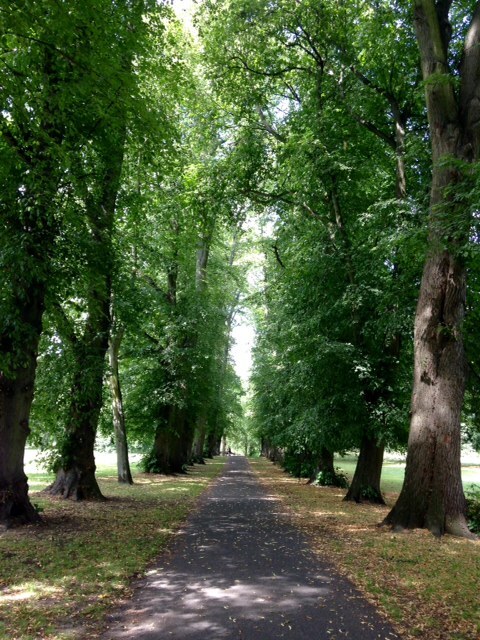 We cycled through eco-reserves with apiaries, watercress beds, ducks and silence. We traversed little stone bridges over rushing weirs and past clear still sparkling pools where local children used colourful nets to try and snap up that tadpole or capture a butterfly. We happened upon two weddings in beautiful stone churches, bells pealing. 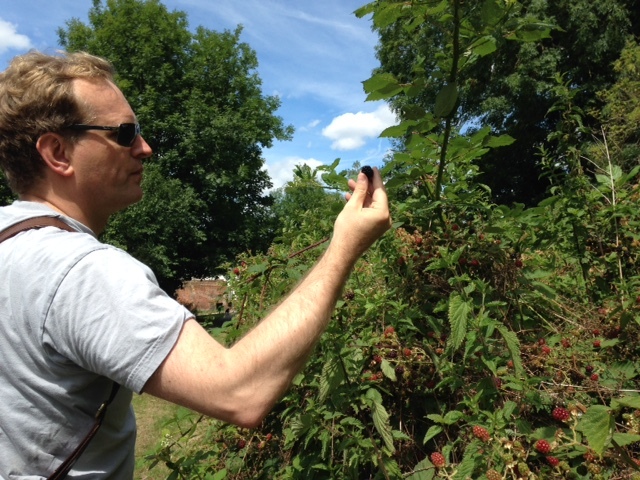 We peddled through shady avenues of trees and stopped to taste some early ripened blackberries. Wikipedia tells me that at its height, the Wandle river was home to up to 90 mills – fabric mills, snuff mills, grinding mills, breweries, plantations and farm land. For two insatiable History lovers we enjoyed our lazy Saturday meander through this lesser known historical gem. 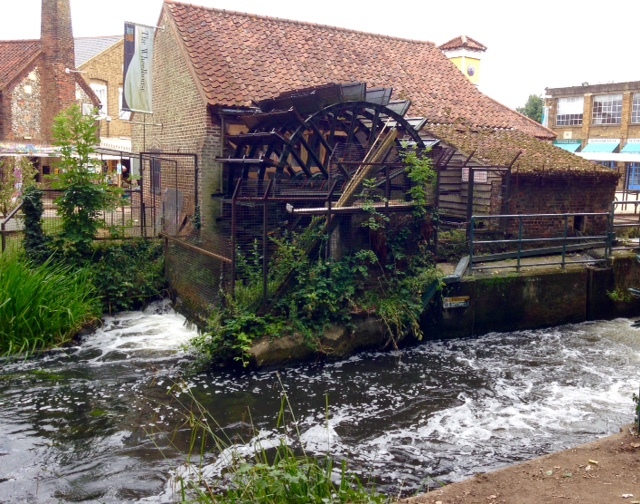 Merton Council have thoughtfully restored an old water wheel and mill stone along the way and tried to preserve some green spaces nestled close to the river banks, but for the rest of its industrial history, we had to use our imagination. Approximately 14 miles later and 2 aching bottoms returned home to rest, sated. Well done to hubby for keeping us on the trail which was rather convoluted and tried at every intersection to thwart us. In other news, DIY has been the order of the week – a consequence of not being in hibernation for a season. When not at my desk thinking creative thoughts or getting serious about barges, I’ve been found painting the loft door, cleaning carpets, doing some repair work in the bathroom, watering plants and generally making a rather satisfying dent in my ‘To Do’ list. What a wonderful weekend you had! Glad it was good for your soul!